A cavalry doctor is determined to help deal with a malaria epidemic on a Kiowa reservation. However, his fellow soldiers disapprove of his compassionate attitude, while the tribe's medicine man resents outside interference. When the Native Americans attack the fort, the medic is branded a traitor. 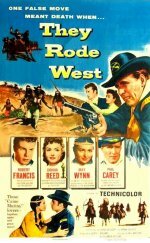 Western, starring Robert Francis, Donna Reed, May Wynn and Phil Carey. In this exciting western, medical officer Robert Francis uses his skill to help the Kiowa tribe, to the disgust of the soldiers at his fort. Francis is reunited with his co-star in The Caine Mutiny, May Wynn, and Donna Reed is second-billed as the niece of the fort commander, a year after she received her best supporting actress Oscar for From Here to Eternity. The story about medical ethics is directed with skill by cult favourite Phil Karlson. The blond, blue-eyed Francis, a contemporary of James Dean and Korean War buddy of film historian Laurence J Quirk, was tragically killed in a plane crash at the age of 25 soon after this film was released.